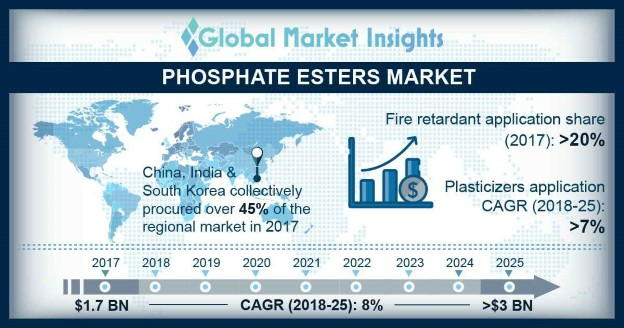 Phosphate Ester Market size will surpass USD 3 billion by 2025; according to a new research report by Global Market Insights, Inc.
Phosphate ester market is witnessing steady growth from Asia Pacific and North America due to increased use of non-halogenated phosphorus esters in numerous industrial applications. The escalating number of property renovation projects and modern construction systems in the region will further stimulate the demand for the product. The major benefit of phosphate esters is their intrinsic fire retarding property which is largely required in formidable applications such as plastic, PVC, film & cables to improve the behavior of plasticized polymers. Triaryl phosphates such as alkyl diaryl phosphates and triphenyl phosphate are two major class of this type of plasticizers. Phosphate esters used in PVC as flame retardant compliments the production of household products. Employment of these esters as fire resistant hydraulic fluid leads to a widespread utility in industries operating hydraulic systems such as excavators, aircraft carriers, hydraulic brakes, power steering systems, aircraft flight control system, lifts, turbines and compressors etc. Dibutyl phenyl phosphate is solely used as an aircraft hydraulic fluid and trixylenyl phosphate is utilized exclusively in the formation of industrial hydraulic fluids. Therefore, increasing usage of the product as a base stock substrate will propel phosphate ester market in coming years. Stringent regulatory compliances related to the toxicity of the product used as pesticides and fertilizers and development of cost-effective alternatives to the product is expected to hinder the progress of the phosphate ester market in the near future. Moreover, development of bio-based esters will likely generate lucrative opportunities during the forecast timespan. With over 40% of the industry share triaryl phosphate ester will foresee growth at a significant pace due to its huge acceptance as a synthetic polyolester base stocks owing to their excellent oxidation stability and good anti-wear properties. The trialkyl phosphate ester market size will reach over USD 400 million by the end of 2025, owing to its rising usage as rust & corrosion inhibitors. Trialkyl phosphate esters are composed as an anti-wear, emulsifying, and antifoaming agents in machinery as engine oils, compressor oils, gear oils, and piston oils. These lubricants are also used as cutting fluids in many industries. Based on volume, fire retardant segment captured over 20% of the phosphate ester market share in 2017. The hydraulic fluid segment is poised to exceed USD 500 million by 2025. The miniaturization trend and fusion prototype sighted in industrial and consumer goods might create an assembly confront. Phosphate ester hydraulic fluids are primarily used in industries where a significant fire hazard would exist if a rupture would occur in a hydraulic line. For example, its plays a vital role in aircraft carriers in aircraft catapult systems, flight deck elevators, steel mill equipment such as hydraulic doors on blast furnaces, control fluid for steam turbines for electricity generation. Based on volume, North America driven by the U.S. will exhibit CAGR of over 7.5%. The regional triaryl phosphate ester market will capture close to USD 350 million by the end of forecast timespan. Moreover, huge expenditure in research & innovation and high technology industrial equipment in U.S. will augment the market growth by 2025. Global phosphate ester market is highly competitive due to presence of large number of industry players as well as unorganized sector. Some major players in the industry are, Clariant, Lanxess AG, BASF SE, Israel Chemical Ltd, Eastman chemical company Elementis PLC, Solvay S.A., Akzo Nobel N.V., Ashland Inc., Lakeland Laboratories Ltd., Daihachi chemical company.